Tuscany, Italy, March 2019: The Argentario Golf Resort & Spa (www.argentarioresort.com), one of the most highly-regarded golf destinations in Tuscany, Italy, has opened a stylish new Club House in time for the 2019 golf season. The new structure is home to the Pro Shop, Golf Secretary’s office and the Club House Restaurant & Bar, which boasts an extensive wooden terrace offering stunning views over the golf course and surrounding hills, the Orbetello Lagoon, often awash with flamingos, and the Gulf of Talamone in the distance. Some history was made in Calgary last November when the National Golf Course Owners Association of Canada gathered for their Annual General Meeting. Lesley McMahon, a golf course owner in Red Deer, Alberta was elected as president of the country-wide association making her the first female president in the not-for-profit group’s history. McMahon, who was NGCOA Vice President the past two years says she was honoured to take over the helm. There may be a few golfers out there who are of the opinion desert golf is basically the same from course to course with some slight change in the number of saguaro with golf ball holes in them. To them I say, au contraire mon ami. Just hop on a plane and head to the Valley of the Sun (Phoenix if you prefer) and you will see what I speak of. I was a junior at Wake Forest in 1948 when Arnold Palmer enrolled on a golf scholarship. RENENS, SWITZERLAND -- TPT Golf is launching its much-anticipated line of revolutionary golf shafts to golfers in Malaysia through MST Golf, the country's largest golf retail specialist. Dallas, TX. - Breakthrough Golf Technology announces a strategic partnership with US sales & distribution company The Duran Group. Due to the unprescented succcess of it's Stability shaft for putters, BGT and The Duran Group have partnered for expanded distribution in the US. The focus will be on course golf facilities and off course fitting retailers. FRENCH LICK, IN (September 17, 2018) ̶ ̶ As French Lick Resort continues to expand its reach and invest in the community, another addition to the resort landscape is coming soon. French Lick Resort is launching construction on a $17 million project that will add 56 guestrooms and a new sports bar, with both being erected in the vicinity of the Event Center and French Lick Casino. The first phases of construction are underway, with both the six-story guestroom addition and sports bar slated for completion in the fall of 2019. The game-changing feature provides golfers with intelligent green maps that auto-orient based the user’s position. It gives an accurate green read with one touch, showing every slope and undulation on the green’s topography and how putts will break. A bird’s-eye view of the green’s contours also helps golfers easily plan their approach and chart out chip shots. No other golf app provides golfers with this level of detail on the putting surface. GolfLogix has also created a light sensitivity mode that allows you to see green details under any light condition. Petoskey, MI – The Inn at Bay Harbor, the flagship property for Boyne Resorts, one of largest golf and resort attractions in North America, has received an Editor’s Choice Award by Golf Digest as one of the Best Golf Resorts in the Americas. The publication's annual review of "The Best Things in Golf" by its editors appears in the May 2018 issue and online at Golfdigest.com. The listing recognizes resorts throughout the United States, Mexico, Central America, the Caribbean, Bermuda and Canada. CARLSBAD, CA - Custom club fitting leader True Spec Golf has officially opened a state-of-the-art shipping container fitting facility at Omni La Costa Resort & Spa's Golf Performance Institute in Carlsbad, Calif. Located just north of San Diego, within the iconic world-class resort, this is their first shipping container fitting studio stocked with a full studio fitting matrix, blueprint station, loft and lie machine, and Trackman. At GoGolfandTravel.com, we receive a lot of products for testing and reviewing. When the iGC package arrived, we were surprised at the quality of very useful golf items in the attractive gift box. So, we took each item out one-by-one and gave them the test of usefulness, quality and value. They all met the test with high marks. There’s something in the package that every golfer can use. One (1) ballmark/on course game sample from Vegas Golf the Game. 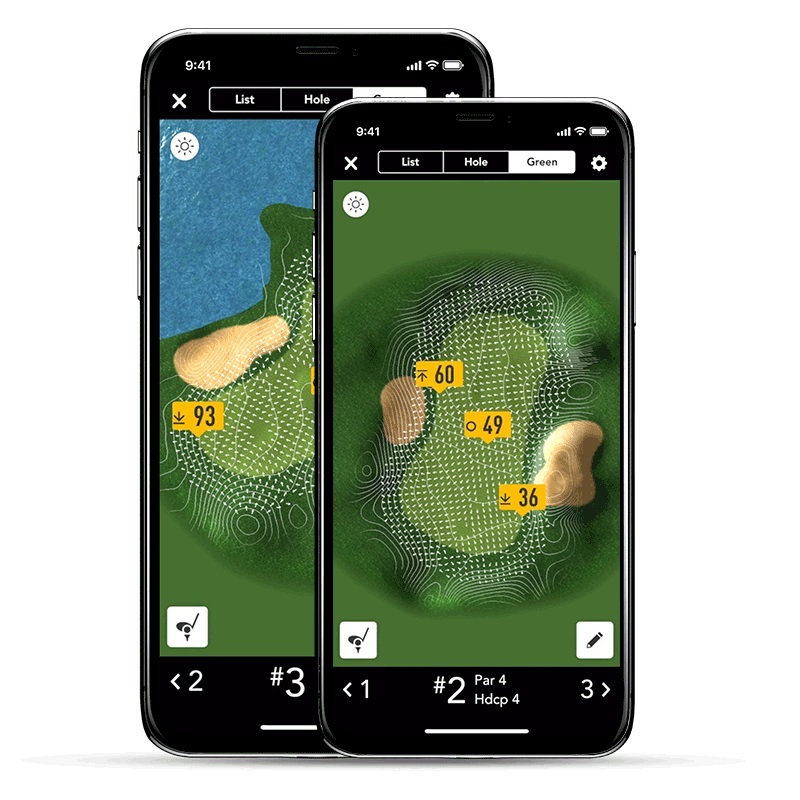 Winston-Salem, NC, – SkyTrak LLC, a joint venture of SkyGolf and SportTrak, announces the release of Version 3.0 of the SkyTrak app. Version 3.0 features an updated look and a variety of performance enhancements. The development and design of new golf courses and resorts in today’s market are becoming few and far between. Silvies Valley Ranch is named for a French trapper, Antonine Sylvaille who discovered the valley in the early 1800's. The 140,000 acre working ranch is located in the central eastern section of Oregon. This new family resort offers two 18-hole reversible golf courses, a 9-hole par-3 course, a 7-hole “gauntlet” course and authentic experiences of the Old West. You ask, “When you have 140,000 acres, why build reversible courses? Why not two typical 18-hole courses?” Well, that’s why this is a good story for both the golfer and the family looking for a unique vacation experience. POIPU, Kauai, Hawaii – With sun-soaked days on an island known for its wealth of activities, Kauai visitors have a lot to fit into their schedule. Poipu Bay Golf Course’s new “Ocean Eleven” program allows golfers to take in the island’s best holes while still leaving time for other experiences. The Omni Homestead is enhancing its Cascades Course, regarded as the finest mountain course in the country, designed by architect William S. Flynn in the 1920s. DALLAS, Texas – Three courses and one clubhouse in the Omni Hotels & Resorts Golf Collection are undergoing improvements as part of Omni’s commitment to its premier golf destinations coast to coast, including two of Omni’s most historic properties — the Omni Homestead Resort in Hot Springs, VA. and Omni Bedford Springs in Bedford, PA.
DALLAS – Omni Hotels & Resorts have hit the sweet spot with its “Magic of Maple” promotion that features mouthwatering libations and menu items created from maple, being showcased this summer at its properties across the country. And at the 12 Omni Golf Resorts, golf professionals are sharing a sweet series of golf tips so golfers can handle “sticky situations” on their world-class golf courses. Whether it’s dealing with a water hazard, handling a tricky lie around the green, or facing an impossible shot to save par – Omni’s professionals can help…before, during and after the round. Los Cabos, Mexico - Avidgolfers who want to savor the luxury of a private villa with friends and family while teeing it up to their heart’s content at Quivira Golf Club, the dazzling world-class course at Land’s End, can take advantage of an exclusive new package. Designed for sophisticated travelers who demand the best, the ‘Ultimate Golf Package’ is a four-night, five-day experience offering plush, spacious accommodations at a Montecristo Estates villa, each with a private infinity pool, indoor and outdoor Jacuzzi, maid and butler service. The richly furnished, beautifully appointed villas, set within an exclusive gated resort community, are designed in a Spanish Colonial revival style and feature panoramic ocean views. The Montecristo Unlimited Golf Package includes food and beverage at on-property restaurants and convenient shuttle access and transfers to the restaurants, bars and facilities of all four Pueblo Bonito Oceanfront Resorts and Spas in Los Cabos. PALM DESERT, CA - Air Force One introduces the AFX Pro Series. The AFX Pro Series replaces the AFO Players Series' irons, featuring less offset and a thinner top line. The AFX Pro Series features Nitrogen Charged technology in the 3- and 4-iron, and an undercut cavity in the 5-iron thru PW. In addition, the AFX Pro Series has matching muscleback 52-, 56- and 60-degree wedges. The irons are soft cast, which produces a soft impact feel and workability. Miura Golf is now offering a new Y Grind option in its popular left handed models while also introducing a LH putter model for the first time. A HIDDEN GEM FOR GOLFERS. SANTEE, SC — A casual observer might think nothing ever changes around sleepy little Santee, South Carolina. While it’s true that this tiny lakeside town with a population of fewer than 900 has remained true to its roots dating back more than a half century, upon closer review you will discover that Santee has been quite busy lately making subtle but tasteful changes with the times. Start with the new exit off I-95 with access to Santee that is going to open in 2016. There are high-powered Tesla charging hook-ups at Clark’s Inn & Restaurant, a new Conference Center, a 17,752-foot, state-of-the-art facility with three breakout rooms can host up to 1,200 people. The YMCA-run Santee Recreation Center and Waterpark, which opened last year, features an aquatics center with an 80,000-gallon pool separated into three sections for all ages, basketball courts, baseball fields, soccer and bocce fields and recreation pavilions — along with a thrilling, 300-foot slide that starts about 100 feet in the air and takes you on a tube down through the three loops. PORT ST. LUCIE, Fla. – Signaling a new era for PGA Golf Club, an impressive, contemporary 20,000-square-foot clubhouse is now complete. Designed by Tom Hoch Design, the facility has more than doubled in size from the original clubhouse, which first opened its doors in 1996. GREENSBORO, Ga. – The National Tavern at The National Golf Village, the newest restaurant at Reynolds Lake Oconee, has been honored in the worldwide “Golden Fork Awards” announced in the current issue of Golf Inc. Magazine. The National Tavern won second place for Best New Public facilities, one of only 12 facilities from throughout the world to earn honors for first place, second place and honorable mention. Kiva Dunes is proud of the guidance and leadership Rea has provided during his four years as Director of Golf at Kiva Dunes and we welcome you to continue to learn the great game of golf from him in his new instructional academy through Honours Golf. Fitchburg, MA - Yves C. Ton-That, a rules official and best selling golf author, has written a new booklet called "Golf Etiquette Quick Reference. A Golfer's Guide to Correct Conduct". Sanibel, Florida…At a special presentation in the educational area of the J.N. “Ding” Darling National Wildlife Refuge, Society of American Travel Writer’s (SATW) past president Jane Ockershausen presented the 2012 SATW Phoenix Award to Refuge Manager, Paul Tritaik.